Last month, temperatures were in the 70s and 80s in Middle Tennessee. Trees started budding and leafing, perennials started emerging early from their winter naps and I rushed to some local nurseries to stock up new plants for the garden. Spring was in the air! Last night, the low bottomed out near 20 degrees Fahrenheit. Highs have been stuck in the 30s the past couple of days (more than 20 degrees below normal). We're supposed to dip down to around 20 again tonight before temperatures start recovering to more seasonal levels. I wandered around the garden this afternoon and happily most of the plants - both new additions and established stalwarts - seem to be taking the cold snap in stride. I don't have pics from today to share, but I did want to share images from last Saturday morning when we awoke to a sudden morning snow squall that had not been in the forecast. It melted hours after it fell, but it was beautiful while it lasted. Enjoy! Ribes aureum, clove currant, profiled just a couple of weeks ago. As you can see, the flowers have opened. I've found that clove currant has a delicious fragrance (can you guess what it smells like? ), but only if I get right down and practically bury my nose in the flower. So far, both the blooms and the leaves seem pretty much impervious to snow or cold, which I guess it is to be expected from a deciduous shrub that leafs out so early. 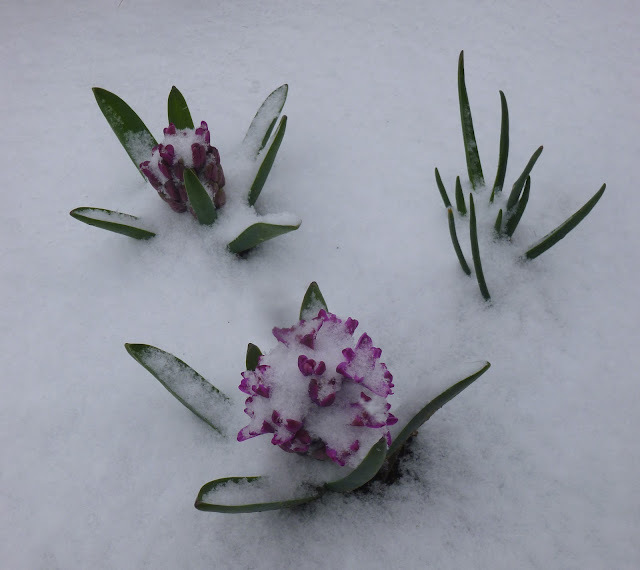 Hyacinthus orientalis (hyacinths)! My first year growing these beauties. Very impressed with their capacity to stand strong amid cold and snow. I think this is 'Peter Stuyvesant'. The clove currant (Ribes aureum) started leafing out in late January. This photo was taken on March 2nd. It's been a relatively warm winter here in Tennessee, as in most of the Eastern U.S. In fact, I just heard that Nashville tied its second-warmest February on record. We did have one cold snap (8 to 12 degrees Fahrenheit) in January, but generally it's been balmy. So it's no surprise that the daffodils popped up a few weeks early. Trees and shrubs are ahead of schedule too, but many deciduous trees are still bare and leafless. The clove currant (Ribes aureum) started leafing out in late January! If you're going to leaf out that early, you have to be prepared for some chilly nights. Indeed, the clove currant foliage seemed undamaged by four or five nights in the mid-20s. As for other early re-leafers, the crabapple tree has started unfurling its leaves over the past week. How about in your garden? Which are the first deciduous trees and shrubs to produce new foliage and/or flowers? And do you have exotics in your garden whose leaves are vulnerable to sudden spring cold snaps?